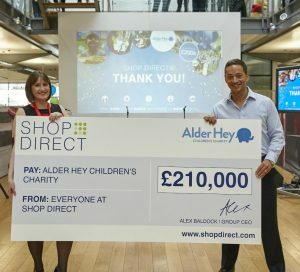 Shop Direct staff have raised £210,000 in just 12 months to support the development of a new digital app for Alder Hey Children’s Hospital. The 4,700-strong team at Shop Direct last year voted for Alder Hey Children’s Charity as its charitable partner of the year for 2015/16. Since then, staff across the company's sites in Liverpool and Manchester have undertaken a variety of fundraising activities, including climbing mountains, singing, running, cycling and abseiling. Members of Shop Direct’s ecommerce team have also been working with Alder Hey’s innovation team to develop the app – the first of its kind in the country – providing advice on design, development and personalisation. The shared vision of the Alder Hey and Shop Direct teams is to revolutionise the patient experience by harnessing the power of consumer technology to help patients be "better informed, calmer, more entertained and, as a result, healthier". Ice Creates, a specialist Liverpool-based digital consultancy, has now begun work to develop the app, which will include a digital map enabling patients to explore and familiarise themselves with the hospital and their ward before they visit the hospital. Users will be able to find out everything they need to know before their visit, from where to park to what to pack and what their rooms will look like. The app will also feature games, providing entertainment and much-needed distraction for patients to reduce anxiety while they wait. A rewards scheme will also be used to encourage healthy lifestyle choices. Ultimately, Alder Hey’s aim for the digital hospital programme is to further develop the app and connect it to a secure patient information system, removing the need for families to repeatedly provide the same information at every visit. The app is expected to launch in 2017. Alex Baldock, group CEO at Shop Direct, said: “I couldn’t be prouder of the effort everyone at Shop Direct has put in to raise £210,000 over the last 12 months. Iain Hennessey, consultant paediatric surgeon and clinical lead for innovation at Alder Hey, added: “Shop Direct has in common with Alder Hey a drive to innovate and do things differently, which has made them the perfect partner for us in developing our digital hospital vision. Together, we’ve been exploring how we can apply Shop Direct’s digital retail expertise to the hospital environment to create our own online ‘shop front’ for Alder Hey.